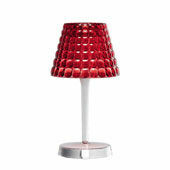 Tiffany is a table lamp in PMMA plastic in a glossy finish: it has a lampshade and LEDs housed the base. The texture of the lampshade ensures a correct distribution of light avoiding glare phenomena. The LED light source is warm (3,000 K). In the base there is an ignition system consisting of a tactile "touch" type on-off switch, which also allows the dimming of the light intensity (from 100% to 5%). A red LED indicates the low battery and a blue LED lights up during the charging phase. Both LEDs are located next to the power button. Lamp available in different colours. Light source: LED, 1 x max 16.5 W.